Using an action/reaction framework, a rotation effort of the feet is created against the momentum of the upper body while the countering of the upper body is created against the ski's rotation into the turn, so there is always a certain amount of tension in the feet, to decouple the two rotations: steering and coiling are connected in the middle of the body. This leads some to say that we're always steering, but that's a matter of the point of view of how separation is created: there is a difference when the "effort" is active (turning the skis) or passive (following a turning ski). The point below is to analyze the relationship between the two and clarify why we like to see steering as any effort above and beyond that required to maintain/create separation. In an upper body-centric point of view, (i.e. asserting that the upper body does not want to turn: it is stable and anchored in the ether or its own inertia), then we'd need to steer the skis to the left, to turn them "underneath" or simply to allow them to keep turning left in relation with the upper body i.e. separation (whether they skid or not could be the result of your edging skills). This view is applicable at low speeds and low tipping angles, where the pivoting of the femurs along their long axis is still related to creating separation. Also, at the end of the turns, when the skis cross under the body, although rotating the femurs now has a completely different effect. There is certain effort to not allow the skis to pivot and unwind, there. If we think instead, that the reaction force from the snow causes an edged ski to turn (i.e. using the ski design), the lower body simply follows the turning ski and then we turn the upper body the other way to create separation (this is counteraction and coiling). 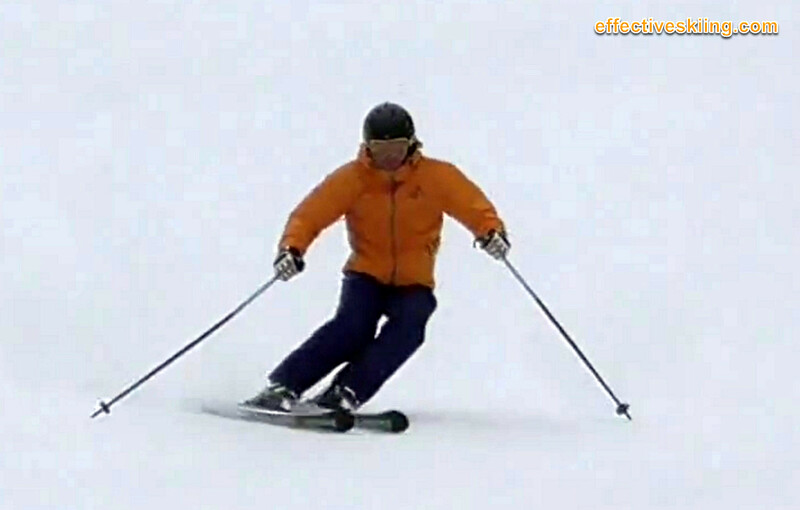 When the ski is turning because of the ski design and snow interaction (when put on edge), there is a certain tension in the lower legs, required for the separation of the upper body from the lower body, where the lower body "follows" the skis around a turn and the upper body does not (i.e. counteraction) - this effort, required for effective separation, is often confused with steering. At one end of the scale, of maximum pivoting/steering and separation, we have sheer twisting and pivoting of the skis, to turn them against the upper body. At the other end, of no pivoting and no separation, we have tipping with skiing square. Good skiing is in the middle of that range. The more dynamic, the more active the core and pelvis are and you get to pick if you ski from the body down (steer under a stable body) or from the feet up (coiling on top of a turning ski). However, the two approaches result in different turn mechanics and dynamics and a keen eye can pick either bias in one's skiing, given the way big vs small muscle groups are used (or rather in what sequence?). top to bottom, i.e. big muscle groups to small muscle groups, i.e. core, hips, knees, feet. Each segment acts on the segment before it, until the movement is effected from one end to the other. Racers and high performance skiers insist on skiing from the feet up, focusing on establishing a platform or base of support. Viewed 512 times ( | Print ) this page.